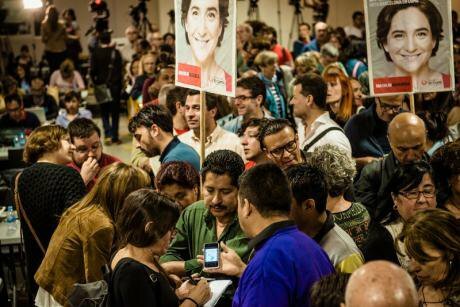 Supporters of Ada Colau, Barcelona's newly elected mayor. Demotix/Matthias Oesterle. All rights reserved.This autumn will see a packed electoral calendar in Southern Europe, with elections in Greece, Portugal and Spain. The results will be interpreted, to a greater or lesser extent, as a verdict on the austerity programme that's been imposed in these countries by governments of all colours over recent years. In contrast, the Catalan elections, to be held on 27 September, are being framed as a proxy vote on independence, a reading widely accepted by the foreign media. However, according to the most recent CEO opinion poll, 21 per cent of Catalans say that the relationship between Catalonia and Spain will be the most important issue in determining their vote, while 59 per cent say they will vote based on parties' policies for dealing with the economic crisis. How can we make sense of this apparent contradiction? How does the Catalan case fit into the wider European context? Following a massive pro-independence demonstration in 2012, Catalan President, Artur Mas, called snap elections to gauge public support for the principle of Catalan sovereignty. While Mas' party, CiU, lost seats, the result of the elections represented an overwhelming victory for the parties in favour of Catalan self-determination. Together they took 80 per cent of the seats in the new parliament and, soon after, voted to pass a declaration of Catalan sovereignty and to ask the Spanish government to transfer the capacity to hold a referendum on independence. Over the course of the following two years, pro-independence Catalans watched with envy as their counterparts in Scotland negotiated the terms of a binding referendum with the British government, publicly debated the pros and cons of secession, and, even, as they eventually lost their campaign. In contrast, the Catalan government's pleas for negotiation were ignored by Madrid, and both its sovereignty declaration and its proposed non-binding referendum were ruled illegal by the Spanish Constitutional Court. A symbolic, watered-down 'participatory process' vote was eventually held on November 9 of 2014, but the issue remained unresolved. The upcoming elections are being framed by pro-independence forces as a substitute for the referendum the Spanish state won't allow. Artur Mas' party will stand on a joint ticket, 'Together for Yes', with Republican Left and a number of independent candidates. The coalition has committed to an eighteen month roadmap to independence should it win a parliamentary majority. In 2011, the indignados occupied public squares across the country to call for “real democracy”, the 2014 European elections saw a new party, Podemos, explode onto the political scene and, most recently, at the May 2015 municipal elections, radical citizen platforms seized control of Spain's major cities (including Barcelona). It is at the intersection of the independence movement and the nueva politica that the relationship of the Catalan elections with the wider crisis of democracy in Europe becomes clear. For many in Catalonia, the 'double crisis', national and economic, is really one and the same: a crisis of popular sovereignty, whether it be in the face of "authoritarian" state institutions or the global financial markets. A similar argument was made passionately by many campaigning for a Yes vote in Scotland in 2014. In the Barcelona mayoral race, Ada Colau (a former grassroots activist) swept to victory calling for “real sovereignty” and “the right to decide on every issue”, including independence, and Together for Yes candidate, Raül Romeva, a former European MP coming from the green-left, has said “the elections of 27 September are about the policy tools at the government's disposal. In order to guarantee increased opportunities and social justice we need the tools of a state.” The prevalence of this view is reflected by the growing strength of pro-independence radicals, particularly the Popular Unity Candidates (CUP). The CUP's slogan 'independence to change everything' neatly sums up the hopes of many in the movement beyond the party. Which brings us back to Artur Mas and Together for Yes. Mas has used his position as president to help keep the issue of Catalan independence at the top of the political agenda. Thanks to this, he has managed to stay in government with the support of Republican Left, weather the storm of corruption scandals at the top of his party, and implement a programme of budget cuts and privatizations to public services. The leadership of the independence process by a conservative nationalist, and fears that Together for Yes is being used as a front to whitewash Mas' party brand, has put many on the pro-independence left in an uncomfortable position, to say the least.